Ride the original 1800's trails that the Wells Fargo wagons, which were use to pick-up precious gold ore from miners that slaved long hard hours bringing it out from the depths of mother earth. Beginning at Hidden Valley we head into the mountains up Falls Gulch, on your sure footed horses, to an abandoned mining and lumber camp on the Rainbow Trail.The majestic vistas and awesome beauty of the Sangre De Cristo Mountains will be etched into your mind as day turns to night and you fall asleep under more stars than thought imaginable. After a hearty breakfast we push on further up the mountain until we reach the Cloverdale Mines.This was one of the richest mines in Colorado history. Here you can explore the area by foot or horseback or choose to relax at camp, located just below the 13,205 ft. top of Eagle Peak.Tonight you'll probably spend dreaming about the gold and silver this mountain produced. If you listen hard, you may still here the miners picks and shovels clanging on the veins deep below us. Seize the moment, the next day, as we move further and further into the wilderness to our final destination Silver Lake. You can only imagine how spectacular the scenery is deep in the heart of these mountains. We'll spend the rest of the day here hiking,riding,fishing or relaxing in the beauty of it all. Day four beckons too soon on this trip. We'll head down the mountain now and meet the Hidden Valley crew, awaiting with a comfortable ride back to the ranch. This equine delight is a guided trip that is one day into the beautiful Rocky Mountains with three days of progressive camping and one day back out to civilization. The morning of departure will be spent getting acquainted with the various animals around the ranch and selecting the horses and tack that will fit you for your trek into the back country. After stowing your gear on the pack horses and getting your rain gear, lunches and other possibles on your own horse, it's off to the first campsite. The Rudibaugh family have been packing groups into this pristine wilderness for over thirty years and visit secluded places known only to them.Count on sleeping under the millions of brightly shining stars that fill the heavens at night. Drink from the high mountain that runs right next to your camp. Wake up to the wildlife at your front door and the smell of breakfast being cooked by the wranglers. Explore old prospectors holes and trappers cabins from days of yore. Enjoy the incredible vistas of mountain lakes and mountain ranges a hundred miles away. Don't be surprised to look up and see an eagle gazing down at you in wonderment. There is only one way to describe this area of Colorado, a photographers dream. HIGH, WILD AND WONDERFUL ! ! For those of you that like and want privacy we also have a five day drop camp package for $795.00. We pack you into a prearranged camp. You stay at that camp for three days and we pack you out on the last day. The first day,your arrival day and night will be spent enjoying the many things Lake View Resort has to offer. Your meals begin with dinner that night.Early morning on the second day you meet your steed and we'll hit the trial. You'll find yourself riding through groves of aspen trees and tight piney forest that open into green mountain meadows. Wildlife watching and scenery make for wonderful photo opportunities. We'll ride to high mountain streams where fishing is bountifully. Each day will present new challenges and places to explore. The nights in the mountains at elevations of 11,000 ft.are simply astonishing and the sunsets are unbelievable. Your camp will be at a different location each night, occasionally at an old sheep- herders camp. Wake up to the smell of breakfast cooking over an open fire. The trails you'll be riding are trails of the old pioneers, high above timberline, through high alpine meadows in some of the most unbelievable areas you can imagine. Your guide has many years of experience in the area and will fill you in on all of the local history, in a place where history abounds. All pack trips are "participation" trips. We have found that when our guest are helping out with camp and the horses it makes for an enjoyable learning experience for all. You'll surely return with cameras full of pictures and hearts full of memories. The gorgeous Fuegian Archipelago where the lakes, the mountains, the glaciers and the forest have the most complex geography in an sensational succession of sceneries. The trees go up over the mountainside looking for the sun and bending themeselves obeying the wind direction and the wonderful rainbows. Imaging the TIERRA DEL FUEGO where adventure, mistery or reality make a strange combination in the so-called Finishing of the Earth, for ever facing the brave waters of the greatest oceans in the earth. In this way its different geography is an amazing, beautiful and strong synthesis of nature: from the calm, almost peaceful steppe plains of the north and the east, to the colossal expression of its mountains and the suprising display of its scenic resources changing towards the south and the west. Navigators and explorers, gold seekers, cattle raisers and pioneer inhabitants, lumber dealers, mineowners and fishermen nad the fuegian romantic muse that inspired the writers and artists who have captured the inhabitants'telluric suggestions in their quatrains and canvas. Reception at the airport in Buenos Aires and transfer to the previously selected hotel. Breakfast. Arrival and reception at the airport of Río Grande. Departure towards the Estancia for staying. Spending the rest of the day for going through the area on your own. Dinner. Staying over. Day 3 to 12: María Luisa Ranch. Breakfast. In the morning departure by horse riding along the Atlantic coast of Tierra del Fuego from San Pablo Cape to Thetis Bay until we reach the rests of the Duchess of Albany shipwreck, following the same way at the Italian priest Alberto De Agostini did in 1932. th The Duchess of Albany ran aground in Policarpo cove in August 17 1893 when she came from Rio de Janeiro and it was wrecked in that part of Tierra del Fuego coast because of the mist. Anyway they continued to Thetis Bay but only one passenger of the ship survived. The only way to get to this site is by walking or by horse riding, where during most part of the journey you will find rests of sailing boats, motorboats, wooden or steel boats. We will be crossing themouth of wide and dangerous rivers, always during the low tide. We will find many elements on our way of which the Museum and the Navy have taken a stock during some expeditions to the spot. During long walks on rocky beaches we will see a red shoe, points of arrows among the stones used by the Onas ,who combed themselves with a very thin dolphin's jawbone. all this is lashed by the wind and the rain. Adventure Horse Riding at the End of the World Mitre Peninsula. Once back, from the sailing boat we can see the Monte Sarmiento ship (1910) beaten by the wind and the Beagle Channel waters. We continue navigating through the Beagle Channel, San diego Cape and Buen Suceso Bay with views on the protected bays, bare coasts full of mystery and promises. This island placed at the uttermost part of the world, is far away. Day by day it is full og signs, light and shade, different colours, golden and silver, tobacco, ochre. Arrival in Ushuaia and tranfer to the previously selected hotel. Dinner. Staying over. 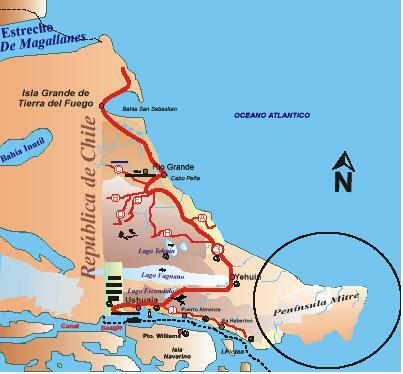 Day 13: Ushuaia - Buenos Aires. Breakfast. Free morning. Transfer to the airport. Arrival in Buenos Aires and transfer to the hotel. Staying over. Day 14: Buenos Aires - Ezeiza. TRANSPORTATION: land transportation, horses and sailing boat. - 5 to 6 daily hours horse riding with intermediate stops. HORSES: They are saddle horses, criolla breed and raised in Tierra del Fuego, whose average height is 1,55 m. They are absolutely tame and reliable, fully adapted to the climate and the fuegian ground; their hooves and legs are very strong and resistant. COMMUNICATION: VHF from la Chaira post, it is last communication. DIFFICULTY: demanding. Basic knowledge about riding and a good physical condition are necessary. - The difficulty is due to: the ground topography: peat-bogs, soft and muddy grounds, bushy forest, steep slopes (going up and down), capes, potholes. The tides: It is very important to take into account for the beggining and the end of the day, because the tour will be done along the beaches. MEALS: they are all included with non alcoholic drinks during the expedition and al coholic when having the last dinner, except in Buenos Aires: meals not included.